Shiba Sensei and the Japanese Department welcomed five students and two staff from Fukui Senior High School Web Site in our sister city, Ibaraki, Japan. The Legacy interviewed one of those students Kiyomi about her experience in America and at Patrick Henry High School. Kiyomi is a senior at Fukui High School who recently graduated (early March) and plans to continue her schooling in a school of cosmetology. Eventually she plans to manage her own business. This was her first trip to America. 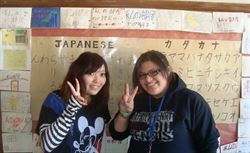 Nancy and Naly, two Patrick Henry students in the Japanese program interpreted the interview questions and answers in fluent Japanese. What has surprised you about coming to Minneapolis? The people here are so formally dressed compared to the people in Japan. Tell us about a typical school day at your high school in Japan. We start at 8:40 AM and end at 3:40 PM. Students stay in one class all day long and teachers move through the classes. There is a school lunch, but I often bring my own lunch to school; usually rice and a meat like little hot dogs. Tell us about your family in Japan. I am an only child who lives in a house that is like the houses in Minneapolis. I've enjoyed my American host family (family of Patrick Henry student) and have fun interacting with one of my host sister's little brothers. Are you involved in any school activities or sports? Do you have Senior Journey events at your school like Prom, Banquet, Trip to ValleyFair, etc. ?